Enjoy some great speakers, check out some exceptional books, meet the authors, get your books signed by the authors, enjoy great food and drink! In addition to book and author vendors, “lit” lectures will be taking place inside the barrelhouse. 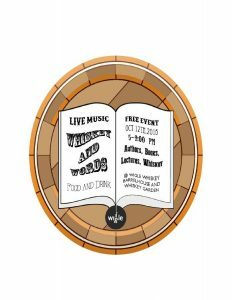 Wigle Whiskey will also be dishing out a bevy of delectable drinks, a traveling food truck will be slinging eclectic eats from Burgh Bites, and there will be live musical entertainment during the evening’s soiree. Michael Buzzelli, comedian, author and host extraordinaire will be our host at Whiskey and Words. Carol A. Briney – Inspirational Speaker and Author of Embracing Your Unlimited Possibilities – A Handbook For Life.